Contact Forms are backbone of any blog/website, they provide a way for the readers to contact the author personally. As Blogger doesn't provide any inbuilt Contact Form, so we will be checking out some third party Form providers like ContactMe and Wufoo. 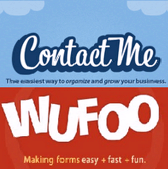 In this post we will see how to add to ContactMe and Wufoo forms into your Blogger Blog and also test some of the extra features these services give. Both these companies also provide premium form services but for any standard blog, there Free service is more than enough to meet all the needs. 2. After Finishing the registration and Logging into your account for the first time you will be asked to Import your Contact , Skip this Step and Click on Add-Ons in the menu above . 1. Go to www.wufoo.com and get yourself registered. 4. After you have finalized your Form Click on "Save Form" , you will be provided a dialog with 3 options, Click on the 2nd and setup Email Notification. You are ready to go now , its upto you to decide which service suits your style. Have any suggestions or having any problems in implementing , please feel free to ask. I am using contact me form to one of my blogger blogs. But I don't know how to customize them. I always use the default style. thank you.you worked hard for this,really very nice tutorial with screen shots. I'm using emailme form for my contact page.It can be customized using CSS. But I'm using the default style also because I don't have much knowledge in coding. Thanks for the info at contact me form. I tried wufoo but I can't stretch the width of the form. It has a fixed size which do not fit on my blog. Contact ME offers a lot. I think you should all try this. You can create buttons and even create a mailing list. Plus, i think they are an affiliate of MailChimp. thanks for you tips n always keep your brilliant post..:D !!! thanks for sharing this with us, I appreciate the hard work. I just want to tell you that your site is incredible, i love to read www.stylifyyourblog.com ! Thanks for this post. After trying Google Docs and FormSmart, I decided to go with Wufoo. It works for me because I only need 2 forms and I don't expect to get 100 entries a month anyway. I was able to tailor the design to my site and the user interface is great too. Click inside a field and you'll see that you have the option to add a highlight color and descriptive text.